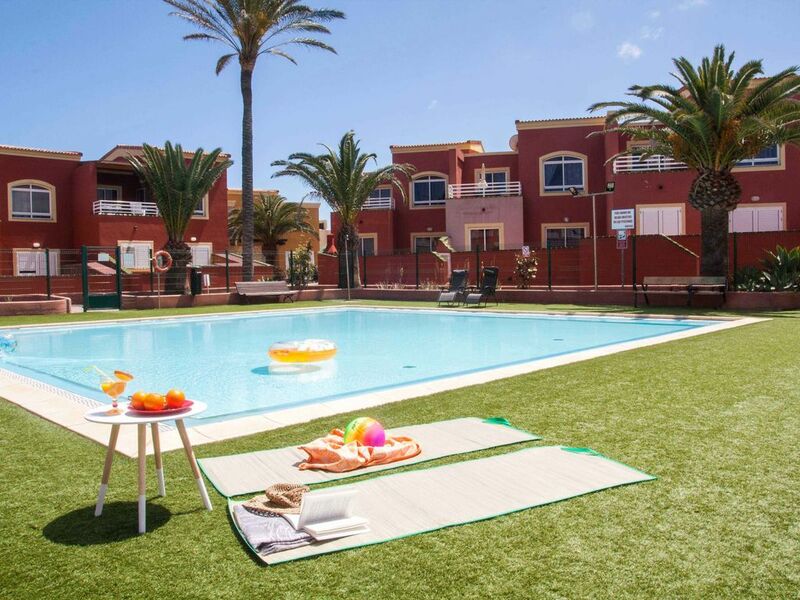 Duna Relax is a duplex located in a quiet residential area of ​​Corralejo. The house has two floors and can accommodate up to 6 people. It has 2 bedrooms, 1 comfortable sofa bed, fully equipped kitchen, balcony, communal pool and all the facilities you may need. It has 2 bedrooms, 2 bathrooms, a comfortable sofa bed, fully equipped kitchen, balcony, pool and all the facilities the visitor may need. Me and my family (2 adults and 17 year old daughter and 13 year old son) stayed here for 1 week in April. The location for us was great as just on the edge of the busy main resort. It was a 5 minute walk to the Camponari shopping centre which had plenty of cafes, shops and supermarket with very good selection. The main street down to the Harbour was another 10 minute walk taking up to 20 minutes to walk all the way. There are lots of shops, restaurants and bars along the way. The 2 pools at the property were immaculate and cleaned every day. Artificial grass had just been laid round the edge of them and this made a huge difference. They are open from 10:30am until 10pm. The balcony at this property gets the sun from first thing in the morning until about 5pm. The sand dune beaches were beautiful and taxi cost about €6-8 each way, with sunbeds/umbrella costing €3 each. Marisa who owns property was fabulous and very prompt at responding to all messages. My only niggle with this place would be to have another set of keys, as you need a key to get in and out of the pool area. Overall though a very good property. Thank you so much for your review Alison!! Fabulous... From the First Enquiry to leaving the Accommodation.. Our Contact was Marisa who was so helpful and courteous, very prompt response with all queries we had, information on the resort from trips to restaurants how to find the residence.. we were met at Las Dunas by Marisa at the agreed time and were shown the townhouse, it was presented immaculately with everything you would need and a few nice extra bits of kit. the terrace is bathed in sunshine all day and has table and chairs, a couple of good sunloungers and parasol, The beds and pillows were really nice and comfortable. A good night's sleep guaranteed, master bedroom with ensuite on the first floor and second bedroom on ground level with fully fitted bathroom adjacent .Two pools in the grounds, with plenty of space for sunbeds and chairs. The house is a comfortable 7 minute walk to the ( Bell Tower) Campanario where several good restaurants, bars, supermarket and retail shops are, the main town centre is another 10 minutes away with bars and restaurants to satisfy most visitors. in closing this review, We, a party of four adults would Highly recommend this property so peaceful and relaxing and are looking forward to returning again. Estamos encantados con la estancia, han sido unas vacaciones perfectas, muy cómodo, bien ubicado, limpio y muy bien dotado, con todos los utensilios necesarios para hacer ideal las vacaciones familiares. La piscina fantástica para que los niños jueguen y que la terraza del apartamento de a la piscina con esas tumbonas maravillosas permitía disfrutar relajadamente del control de los niños mientras ellos se bañan.